Petoskey was good to the boys this morning. As we were leaving the small but abundant town, the boys told Stewart all about their stays. Two separate host families woke up their boys in a unique way: they serenaded them. One man made our gentlemen wake up to a song he always sung to his own sons: the national anthem. Another man sang “O What a Beautiful Morning” from the musical Oklahoma. Other boys stayed with retired librarians, received silver dollars, talked about D&D, danced to music when the TV didn’t work, learned what it meant to be a “plantaterian”, attempted to play with a big fuzzy dog, and stayed in the summer home of the famous American writer Ernest Hemingway. Their final stay at host homes was a great one on which to end their tour. Many memories were made, not only with last night’s host families, but with all of their host families throughout their 18 days on the road. The boys will remember their stays for ages, and will benefit from meeting so many people in so many states and countries. We left Petoskey for Rothschild, WI. It was a bright sunny day with just enough chill to either wear pants, a long-sleeved shirt, or a make-shift blanket with what you have on the bus. 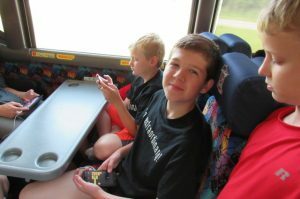 The boys enjoyed their games while Charlie drove them safely from the Lower Peninsula to the U.P over the 5 miles of the Mackinac Bridge. 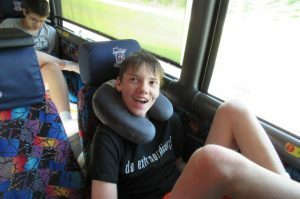 The weather was still beautiful, and the boys could see the blue waters of Lake Michigan glistening up at them from high in the air. 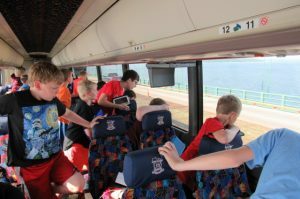 Many boys took pictures in awe of the majestic bridge, but were soon back in their seats playing games as the bus touched ground on Michigan’s northern half. We stopped at a park in Manistique, WI for lunch and a couple hours of playtime. 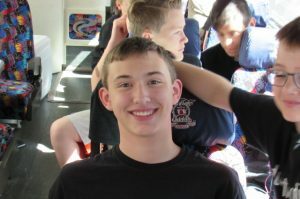 The boys enjoyed their homemade lunches of turkey sandwiches, gooey chocolate banana bars, and Haribo gummy bears. Spread out throughout the playground, marina, and grassy field, some boys played ultimate frisbee while others played on the swing sets and slides. 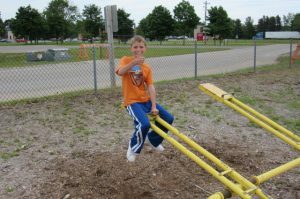 There were teeter totters in the playground, and there was at least one boy who had never played one before. 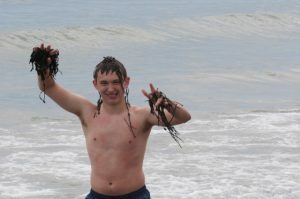 You know, from the first taste of calamari to the first ride on a jet boat, I and the staff are so pleased and honored to be part of these boys’ lives. This tour had a lot of “firsts” for some boys, and it’s so amazing to witness those minuscule but landmark moments with them. Is there a character from any book, game, or movie that you think about sometimes? “My character from D&D Drak Skarfold. He’s a bounty hunter, and he’s a lizard folk. Chris, thank you so much for being part of the choir. We crossed into the Central Time Zone on our way to Rothschild, and got into town in time for dinner. 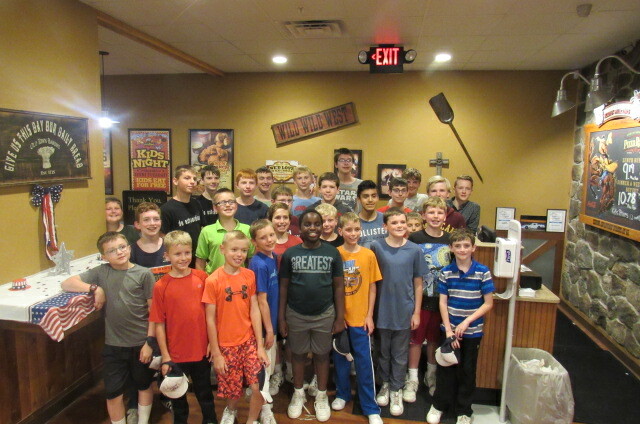 The staff found a local Pizza Ranch, and we drove the boys there for dinner. By this time the boys were a bit testy with each other. I’m pretty sure they were hangry because once they got a sizeable amount of delicious buttery-crusted pizza in their bellies, they were happy singers. 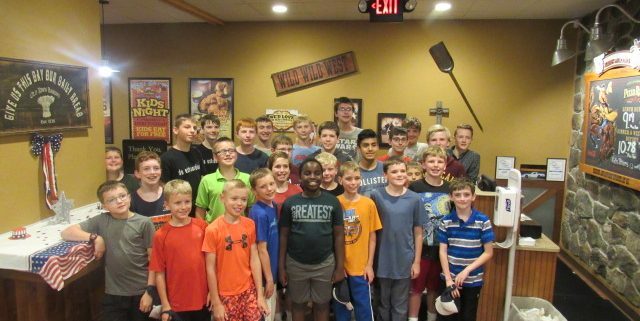 The staff at Pizza Ranch thoroughly enjoyed how well-behaved the boys were. 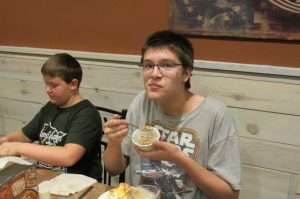 We celebrated two birthdays today: Josiah and Reece. We shared cake and songs with the staff. They sang Happy Birthday to the two birthday boys, and our gentlemen sang “Morokeni” for them and the patrons at the end of the evening. Now, the boys are falling asleep in their hotel rooms, having had some pool time for their last night of tour. They’re ready to come home tomorrow, sing for everyone, and then rest well in their own bed petting their own dogs, being tucked in by their own parents. See you at the concert. Goodnight.